That’s right! You read the headline correctly, a new Mini Majano Wand has been in the works for a long time, and we are finally ready to start production on a 5″ version of the classic Majano Wand! We carefully considered all the needs a reefer has when controlling nuisance Anemones & invasive corals, and we chose to make a 5″ version of the Majano Wand so you can have complete control and freedom when eradicating your aquatic foes! Get ready Nano Tanks, your need has just been filled! Get ready Nuisance Anemones, you’re about to get eradicated no matter where you hide!!! The Majano Wand (patent pending) does not kill through direct electrocution, instead, this device operates on the principles of electrolysis. Since the physical composition of Majano Anemone are mostly water, it essentially disintegrates them on contact. We say seek and destroy. We all say it works like magic!!! 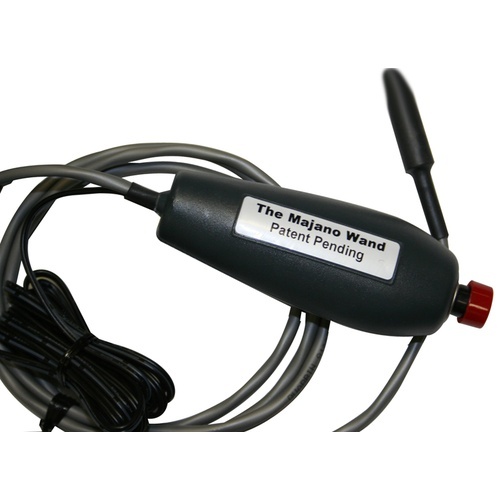 The purpose of the Majano Wand is to eliminate Majano anemones in hobbyist reef aquariums. These “pest” anemones that are accidentally added to reef tanks can multiply very quickly. They should be eliminated because they sting the rare and expensive animals we are trying to house. The Majano Wand does not kill by electrocuting the animal. It operates on the principal that when electricity is emitted into salt water it produces two gases. One of these gases is hydrogen and it is what is generated at the stainless steel tip. Hydrogen is the lightest element on earth and when the probe touches the Majano it causes the water in the cells of the animal to turn into hydrogen. These animals are mostly water so the animal just disintegrates. The device operates on low voltage and will not shock you if your hand is in the water. 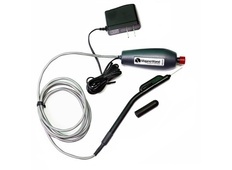 The entire Wand can be submerged but do not get the push button or power supply wet. Keep the device away from children and be very careful that you don’t stick anyone. Remember, the rod is acrylic and very fragile, it can break, don’t bend it. Always keep the push button and power adapter out of water. The probe is dulled but still sharp, be careful. Only use according to the directions. 1.Uncoil the wires and plug in the power supply. Carefully, remove the plastic cap on the tip of the Majano Wand. 2.Push the button, as you stick the needle in/out and on/over a Majano. Do Not Hold The Button Down when not touching a Majano. 3.Keep sticking the needle in/out and sliding it across the Majano, as it will only kill the parts of the Majano that touch the needle. After five or six insertions, the anemone should be all white and gooey looking. 4.If you see any tentacles or tissue still alive, just touch them/it with the needle while pushing the button. It is sometimes easier to slide the side of the probe along the Majano rather than stick it. 5.If you do not kill the entire animal it is possible for it to regrow in a short amount of time. White “goo” should float to the top when the Majano is dead, remove this goo. Repeat steps 2 and 3 when needed. 6.Don’t keep the button pushed continuously (we are not talking about a minute or two here, we are talking about a larger scale) as the device does emit some gases into the water. (see chart below) After an hour, you can use it again. 7.When finished, Run/Soak the tip in fresh water for a minute and dry completely. 8.Replace the cap and store in original box for safety.